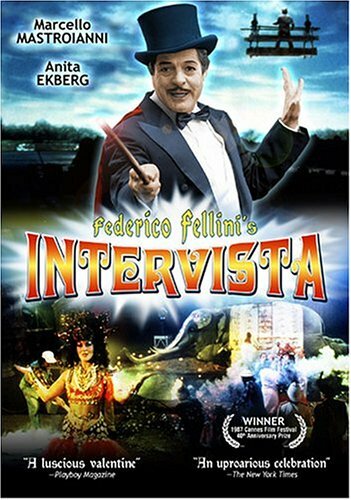 Federico Fellini's penultimate film did not open in the United States until 1992, and despite the director's high reputation, it was received with little enthusiasm. Perhaps the world had grown beyond the colorful, psychedelic ramblings of an old artist. I myself don't particularly like any of Fellini's films beyond 8 1/2, but I thoroughly enjoyed Intervista, a lovely, rather restful piece of nostalgia. The film wanders through several different "plots," beginning with a celebration of the 50th anniversary of Cinecitta, a huge movie studio just outside of Rome that was the center for many of Fellini's classics. In Intervista, Fellini prepares to shoot a (nonexistent) film of Franz Kafka's Amerika, while at the same time re-imagining his first trip to Cinecitta as a young man (played by Sergio Rubini) to interview a famous starlet. At the same time, a band of Japanese journalists interview the real Fellini (as himself) and Marcello Mastroianni turns up, dressed as a magician. The whole crew then visits Anita Ekberg, watches a scene from La Dolce Vita, then gets back to work. Intervista moves with the same dreamy weirdness as something like Juliet of the Spirits, but the arty condescension is gone. Now it's all beautiful sadness and longing and acceptance. It's the joyous, mature work of an grand old man, and it would have made a great final film, if not for the fact that Fellini made one more, The Voice of the Moon (1990), that has yet to be released here. DVD Details: Koch Lorber's DVD comes with a full-length making-of documentary, a photo gallery and a trailer.